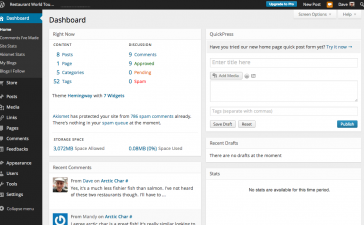 News about WordPress. Main events, updates analysis and everything that in some way has something to do with WordPress. What influencer says, new technologies, what are big companies doing, best and latest releases, policies changes and much more. All this and some more can be found under the category news. If you know something that we don’t, please leave a comment and share it with us. Illuminate everybody with your knowledge. We and our readers will be very grateful. Also if you want to go further, we encourage you to put it in words writing a guest post. All you have to do is register and publish your post. Publishing a guest post is very easy and it will be a honor for us if you decide to do it here. And if you like what you’ve found here, show your gratitude by sharing it with your friends and workmates in your social media network. We hope you’ve found what you were looking for here. If not, please let us know what was it. For that we have our Q/A section, where you can ask whatever you want. We answer in short time and of course, anybody can do the same. Thank you so much for being here, we are very pleased with your visit.